While the Mai Tai has always been one of the classic tiki drinks for highlighting what rum can do, more recent years have seen the development of cocktails that take its basic mold and twist it in a bitter direction. Most well-known include the Campari-based Bitter Mai Tai and the Angostura bitters-based Stormy Mai Tai. 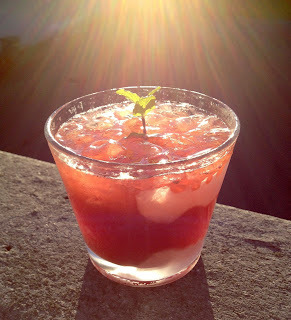 I based this on the structure of the Bitter Mai Tai and was inspired by the Angostura bitters of the Stormy Mai Tai to remake it with Amargo Vallet, a Mexican bitter liqueur that, unlike Angostura bitters, actually includes angostura bark in its ingredients. It has a very strong and somewhat peculiar flavor that is unlike any other amaro I've tried before, so I wasn't sure how well it would play with the more tropical flavors of the Mai Tai, but I'm pleased with how this turned out. Combine all ingredients, shake with ice, then pour unstrained into a chilled rocks glass. Garnish with a sprig of mint. The nose is dominated by the rum's esters, with the amaro peeking around the edges. The sip begins with sweet rum esters, turns bittersweet with a balance between the rum, orange liqueur, and orgeat, there's a bump of cherry cough syrup in the middle, with the more bitter/herbal notes of the Amargo building towards the back, and a cola/orange note going into the long, bittersweet finish. All through the lime keeps it from getting too sweet and adds a little extra bitterness from the oils in the peel. Despite the strong old time-y cough syrup vibe, this actually works. While less approachable than the Bitter or Stormy Mai Tais, Amargo Vallet isn't totally out of place amidst the tropical ingredients. 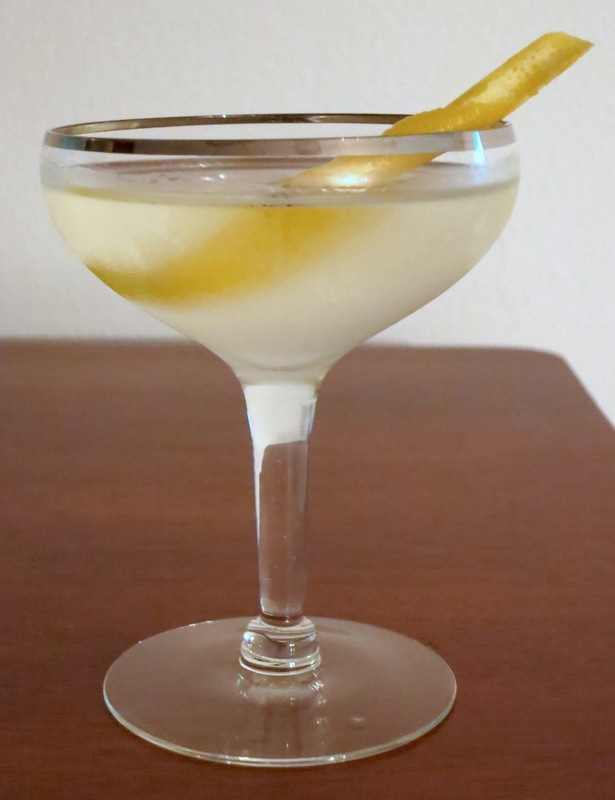 The critical part is that the segues happen in an appropriate sequence, shifting the balance of the cocktail from front to back in a relatively smooth fashion as opposed to the jarring transitions that happen when ingredients don't mesh with each other. Speaking of ingredients, Denizen 8 was a good pick here because it gives a solid layer of ester funk without overwhelming the flavors like Smith & Cross would. While I can't see this ever catching on, it is something that I would happily make again. If you asked whisky drinkers what their primary association is with Glenmorangie these days, my guess is that they would say 'cask finishes'. They have become far more prolific in recent years, but Bill Lumsden has been churning them out for decades now. This whisky used to be a part of the distiller's core lineup in the early-2000s, but was later replaced with the 18 Year. It's made from ex-bourbon cask whisky that was finished in new oak for an indeterminate amount of time, then bottled at 43% with chill filtration and possibly coloring. Thanks to Michael Kravitz for splitting this bottle with me. Nose: mostly oak - but not too sharp, gentle floral malt, caramel, honey, lots of vanilla, a little chipotle pepper, cacao, fresh vegetation in the background. After adding a few drops of water more caramel comes out but it is flatter overall. Taste: rather sweet, balanced malt/oak, caramel, not very tannic, vaguely fruity throughout. After dilution it is similar but flatter. I'll admit to being a bit disappointed by this whisky. I was hoping for something like the Original, but with more refinement and complexity from the extra age. While I wouldn't say that the virgin oak finish ruined the whisky, it did overwrite a lot of the more subtle character that I like in a Glenmorangie. So all in all, I can't say that I'm sad to see the end of this (small) bottle. Check out Michael's review from the same bottle for a slightly more positive take. While Ireland produces single malts and blends much like Scotland, its unique whiskey is pure pot still. 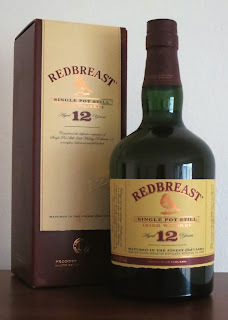 It is made from a mixture of malted and unmalted barley that, as the name suggests, is distilled in a pot still, usually three times like most Irish whiskeys. With one exception, all of these are currently being produced by the Middleton distillery in Cork. 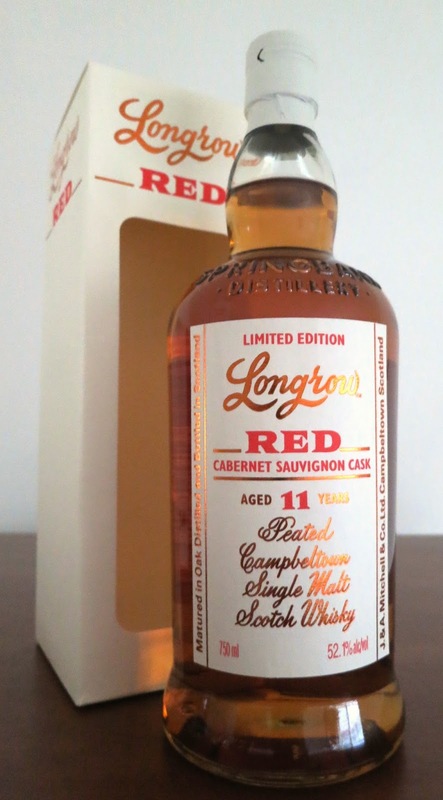 It is claimed that the unmalted barley gives the final product a spicier and more full-bodied character, but I never found out until I decided to take the plunge right before the price of this whiskey went up locally. This whiskey was aged in a mix of ex-bourbon and ex-sherry casks, then bottled at 40%, with coloring and chill filtration. Nose: toasted grain, caramel, muddled fruit/sherry overtones, vanilla, light oak, a touch of something floral. After adding a few drops of water a lot of the complexity disappears, replaced by smooth grain with a savory edge. Taste: grain and oak sweetness up front, light tannins with vague fruit/sherry/orange peel in the background come in around the middle, with a slight bump of oak, creamy vanilla malt, and baking spices near the back. After dilution it becomes a bit softer and the fruit is largely pushed towards the back. This is... fine. The grainier notes from the unmalted barley in the mix take a little while to get used to, but after that it's just OK. I kept waiting for some epiphany, since so many people, including many with palates that I know and respect, rave about this whiskey. But it never clicked with me. There are any number of scotch blends that would be as good or better for far less money, so I can't imagine this finding space in my liquor cabinet again. Bowmore is one of the distilleries that has, for quite a bit longer than many other distilleries, had an NAS release holding down the bottom end of their core lineup. Before this was filled by Legend, but five or six years ago this was reformulated with the trendier Small Batch label. The new version was put together entirely from bourbon casks, without any sherry to temper the spirit. Nose: light but balanced - malt, herbal, smoke, dry Bowmore peat, berries, apple, floral vanilla. After adding a few drops of water the peat becomes drier and is joined by dusty oak, the sweetness mostly retreats except for a bit of vanilla, and the fruit/floral notes mostly disappear. Taste: thin throughout - light malt sweetness, mint, vanilla, and vague smoke, oak in the background until the finish, with a little bit of plastic at the end. After dilution the sweetness is amplified up front, but the peat becomes stronger and dries out the finish. I will give Bowmore this - they've managed to make a completely inoffensive peated single malt. Unless you are opposed to peat in general, there is little to be bothered by here. Also, for an NAS malt, there are almost no rough edges. It can't hold a candle to their age dated single malts, let alone a bruiser like Tempest, but that's not its goal. Where it really shines is in cocktails. I first had this drink at Dutch Kills in NYC and it's been one of my favorite Negroni variations ever since. Combine all ingredients, stir with ice for fifteen seconds, then strain into a chilled coupe and garnish with an orange twist. The nose dominated by the malt and peat of the whisky, with bitter notes from the Campari and vermouth in the background. The sip begins with moderate sweetness with hints of peat in the background, spice notes from the Campari and vermouth dominate the middle, with a fade out through oak and stronger peat, with grape from the vermouth in the background throughout. The finish is balanced between bitterness and peat, with the chocolate bitters finally showing up giving it a lingering burnt chocolate/coffee flavor. This is one of those drinks that has a number of competing recipes that all get the same name, though the general structure stays the same. The big split is between the versions that use dry sherry and those that use dry vermouth. Either way, they tend to be refined and elegant like their namesake. Combine all ingredients, stir with ice for fifteen seconds, then strain into a chilled, absinthe-rinsed cocktail glass and garnish with a twist of lemon. The aromas are balanced between the gin, lemon, and maraschino, with the last just pushing above the others. 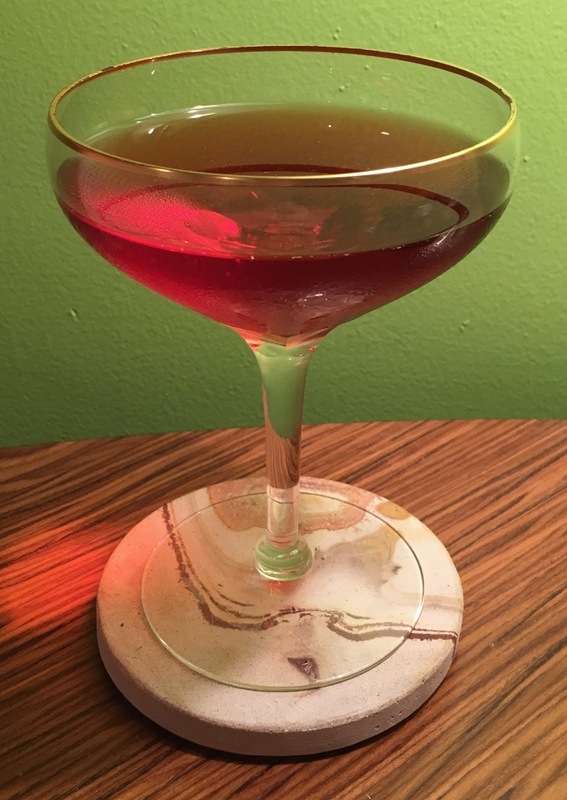 The sip begins with a moderate amount of sweetness, which turns into a sort of thickness around the middle as the gin and vermouth dry out the flavors, with a gently bitter finish dominated by the vermouth with anise in the background. 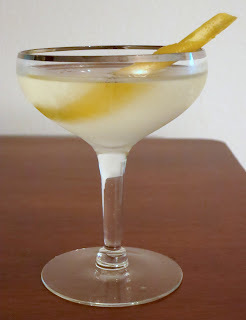 This is the first Martini variation that has really clicked for me. Admittedly, it's extremely wet by modern standards even before the addition of the maraschino liqueur, but it's still nicely palate-cleansing in the finish. I do wonder if the balance is a bit different than it's supposed to be since I used Plymouth navy strength and scaled down the amount to account for the extra alcohol, but my guess is that it's pretty close. I can also imagine this being rather good with a more floral gin like Hendricks or you could push it in a more savory direction with something like Sounds Spirits Ebb+Flow. Whatever gin you pick, the results should be tasty.